Viralthread.com | If you thought the local graveyard was the scariest place on Earth, think again. You’ve probably never felt the need to visit Turkmenistan – some of you may have never heard of it – but after reading this, you’ll definitely be tempted to book a flight. Out in the middle of the Karakum desert, over 150 miles from the country’s capital city, a fire burns. 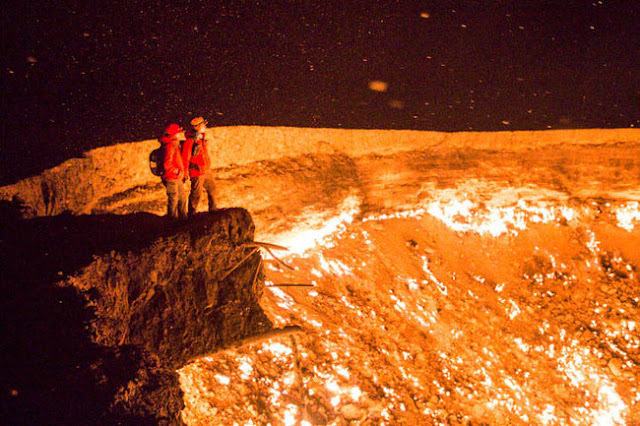 Inside a 230-feet across and 65-feet deep crater burns a fire which has been raging for over 40 years, and has now been nicknamed “The Door to Hell,” or “The Gates of Hell”. 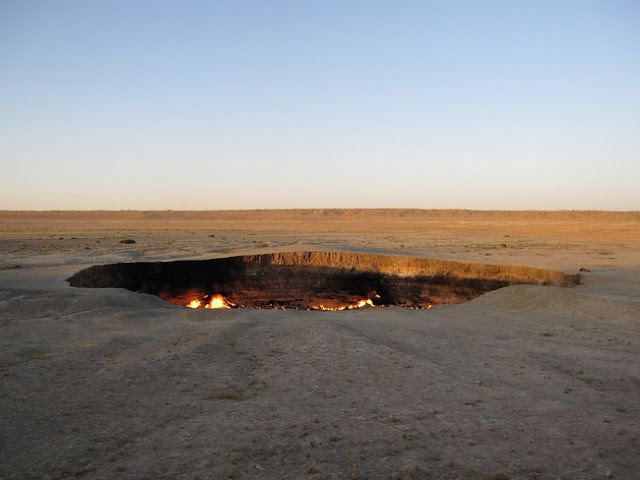 It’s official name is the Darvaza gas crater, and it was created in 1971 when a group of Soviet geologists visited the Karakum desert in search of oil fields. After finding what they believed to be a substantial oil field, the scientists constructed huge pieces of equipment on the site and began drilling. Unknown to them, they were actually drilling on top of a cavernous pocket of natural gas, and unable to hold the weight of the equipment, it caved in, taking the equipment with it. Nobody may have been killed in the incident, but the scientists still had a he problem on their hands; the giant crater expelling copious amounts of gas, composed mostly of methane, causing the area to become very difficult to breathe in. This was not an issue for humans, as nobody inhabited the area, but it certainly was a problem for the desert wildlife, as one by one, animals started to collapse and die. In addition, with that much methane escaping into the air, the area was prone to a devastating explosion. To combat this, the scientists did what any other person does when they have something difficult they need to get rid of – they set it on fire. 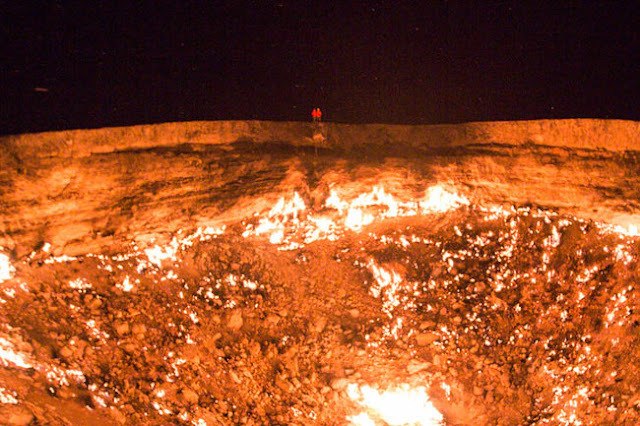 However, despite hoping that the gas would burn out over the next few weeks, the crater just continued to burn, and burn, and burn, all the way to this present day – creating an open gate to a fiery hell in the middle of nowhere. To add to the nightmare of this fiery pit of hell, witnesses have often seen thousands upon thousands of spiders throwing themselves into the flames, as they’re lured to the deaths by the enticing glows and flashes. Burning off gas, or ‘flaring’, is common practice in oil drilling operations. However, usually the researchers know exactly how much gas they’re burning off, and don’t end up with a near-decade long bonfire. The literal hellhole is now a huge tourist attraction for the country, as officials continue to carry out no action against the raging fires.